Today in the U.S. we celebrate Memorial Day to honor and commemorate all the brave American men and women who died in service to this country and made it possible for us to enjoy our precious freedom. As we enjoy time with our families and friends and the traditional beginning of Summer (and barbecue season!) today, let’s pause for a moment and give thanks for those souls and their families, all who made the ultimate sacrifice. 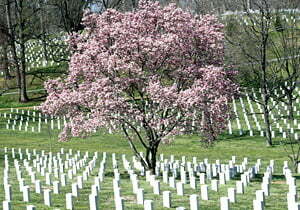 Bless them, and all those who serve. This is such an interesting and flexible tangle pattern. Boomerangs was created by U.S. Federal employee Teresa Clerc. Originally Teresa was inspired by architectural Gothic arches but as the pattern developed Boomerangs became its name. Boomerangs has loads of possibilities for variation. You can draw them all in the same or opposite orientation, overlapping in different ways, and/or alternating the rows, and the fills can be changed in a multitude of ways. These are two versions I played with and Teresa illustrates more below. “I live in Arizona. I have a Bachelor of Science degree in Agriculture, major: Horticulture from the University of Arizona. I have always loved art. I primarily do charcoal, pencil, or ink drawings so the black and white Zentangle method suited me just fine. I also crochet which is why I love the patterns and the repetition of the patterns. When I saw the Zentangle link on a website and click it open, I fell in love with it. It fact, I could not stop doing tangles because it was so relaxing. I found myself being inspired again. I brought out my art stuff and dusted off the cobwebs from my drawings put away for years. My daughter didn’t realize that she had a Mom who was an Artist. Using the Zentangle method, I am back to myself again and better. 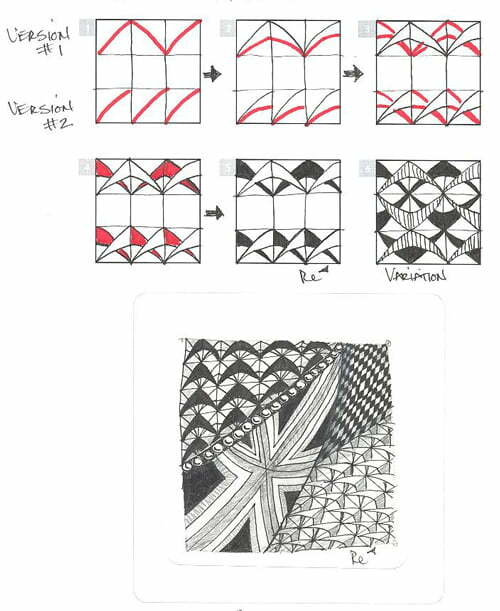 Teresa illustrates the step-by-step instructions for drawing Boomerangs and a variation below, along with a Zentangle® featuring Boomerangs with another variation. Check out the tag teresac for more of Teresa’s patterns on TanglePatterns.com. Lovely story and great tie-in for Memorial Day. A delightful pattern I can’t wait to try. Thank you for sharing. Very intriguing pattern, I especially like how it lends itself to so many variations I will be giving this one a try. Also, thank you for the mention and honor for our fallen service men and women. Wonderful pattern with so many variations! Looking forward to trying this one. Love getting all the patterns. I am now hooked on this drawing method and all my times goes into it. I need to get my house clean. Kudos!!! to Teresa! for designing this striking pattern — you are an inspiring Tangler who is lovely inside and out! Also your daughter, Lauren, too! Sooo glad that Zentangle is making a difference in your lives, in so many varied ways!